Exports, and the jobs from them, will play a big role in ensuring U.S. economic growth during the coming years. Expanded free trade, along with investment in infrastructure and human capital, will facilitate that growth. by Greg Bell, a writer in the International Trade Adminstration’s Office of Public Affairs. It’s been the consensus of both economists and businesspeople that exports support well-paying jobs and help U.S. businesses compete in the global economy. President Barack Obama hammered that point home on September 8, 2011, in a speech delivered before a joint session of Congress. In the speech, he emphasized how exports have played—and must continue to play—a significant role in the continued economic recovery of the United States. To help make this growth happen, Obama called on Congress to clear the way for pending free trade agreements (FTAs) with Colombia, Panama, and South Korea and a renewal of Trade Adjustment Assistance. The three agreements, once in force, will support tens of thousands of U.S. jobs. The South Korean FTA, through tariff reductions alone, would boost annual exports of U.S. goods by up to $11 billion. The FTA would also create new opportunities for U.S. exporters in South Korea, which had a gross domestic product of $1.5 trillion in 2010 and is the world’s 12th-largest economy. Liberalized access to that market will help strengthen the trade competitiveness of the United States. Obama’s remarks about the FTAs and exports came as he unveiled the American Jobs Act, a proposal designed to put people back to work. According to independent analysts, the law would create as many as 1.9 million jobs. In addition, the act provides for a mix of tax cuts that are designed to help small businesses hire workers, to put more money in people’s pockets, and to spur consumer spending. 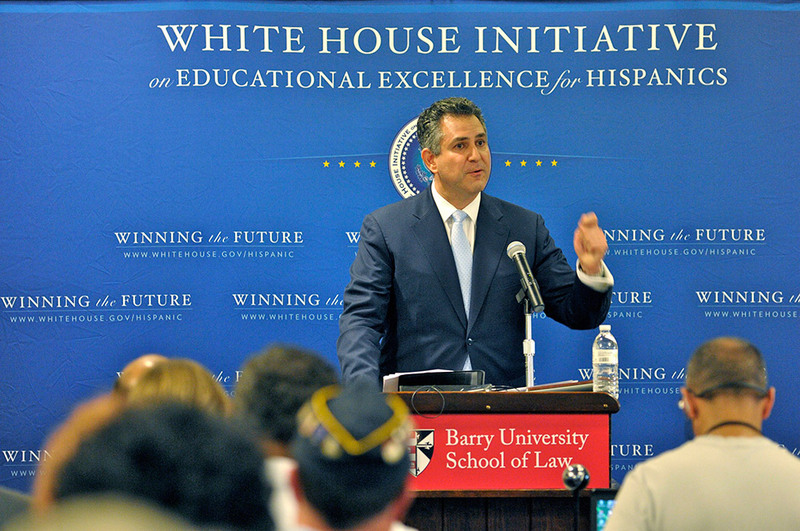 On September 9, the day after Obama’s speech, Francisco Sánchez, under secretary of commerce for international trade, addressed attendees at a meeting of the White House Hispanic Policy Conference in Orlando, Florida. Sánchez talked about the American Jobs Act and stressed that the president’s proposal would not add a nickel to the federal budget deficit and would have an immediate, positive influence on the U.S. economy. According to the latest export figures from the Department of Commerce, U.S. companies are increasingly embracing exporting as a business strategy. In July 2011, U.S. exports of goods and services were the highest on record, increasing 3.6 percent over June 2011 to $178 billion. A significant portion of this growth was because of travel- and tourism-related activities. International visitors spent a record-setting $13.3 billion during July. During the first seven months of 2011, overall export growth was up 16 percent compared to the same period in 2010. That increase keeps the country on track to meet Obama’s goal of doubling exports by the end of 2014 through the National Export Initiative (NEI). To ensure that those positive export trends continue, the International Trade Administration (ITA) plays a key role in overseeing the application of international trade rules, strengthening U.S. commercial ties with other countries, and advocating on behalf of U.S. companies to ensure that there is a level playing field on which they can compete overseas. And along with the other federal agencies in the President’s Export Promotion Cabinet, which Obama established to develop and coordinate implementation of the NEI, ITA is taking steps to increase the availability of credit to small and medium-sized enterprises. Those efforts work to support U.S. competitiveness in global markets. As Obama noted, “We now live in a world where technology has made it possible for companies to take their business anywhere. If we want them to start here and stay here and hire here, we have to be able to out-build and out-educate and out-innovate every other country on Earth.” It is a challenge the U.S. economy will face as it continues down the road to recovery.